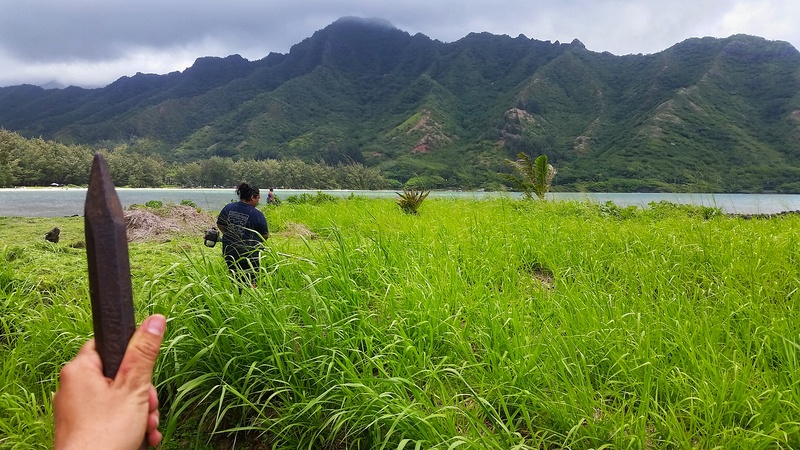 This past Thursday I went to the field to scout field sites on the Northeast side of Oʻahu. Here, many sites with groundwater inputs were traditionally used for aquaculture in Hawaiian fishponds. These embayments already provided a good habitat for juvenile fish; the Hawaiians, recognizing the natural nurseries of valued food species, imposed rock walls around these areas in order to cultivate these species in their natural environment. These areas provided a sheltered, steady supply of fish while ocean fishing is not always as reliable. The pond also provides a sheltered natural environment for limu to grow, thus, these herbivorous fish species do not need to be fed as their natural food source is cultivated by the pond system. The six kinds of fishponds found in Hawaii are a unique and advanced type of aquaculture found no where else in the world. A key feature of these ponds is the mākāhā, the sluice gates that allow smaller fish to leave the pond, but prevent larger fish from escaping. Combined with the brakish water this creates an environment for species that travel between fresh and salt water during their life cycle, such as ‘ama’ama (striped mullet, Mugil cephalus), awa (Milkfish, Chanos chanos), pualu (surgeonfish), palani (Eye-stripe surgeonfish, Acanthurus dussumieri), āholehole (Hawaiian flagtail, Kuhlia xenura), moi (Sixfinger Threadfin, Polydactylus sexfilis), kākū (great barracuda, Sphyraena barracuda), and papio (young trevally). Heʻeia fishpond, in Kāneʻohe, Oʻahu. Heʻeia fishpond was built 600-800 years ago, and is one of the largest, if not the largest, in the Hawaiian islands. Heʻeia comprises 88 acres of water. 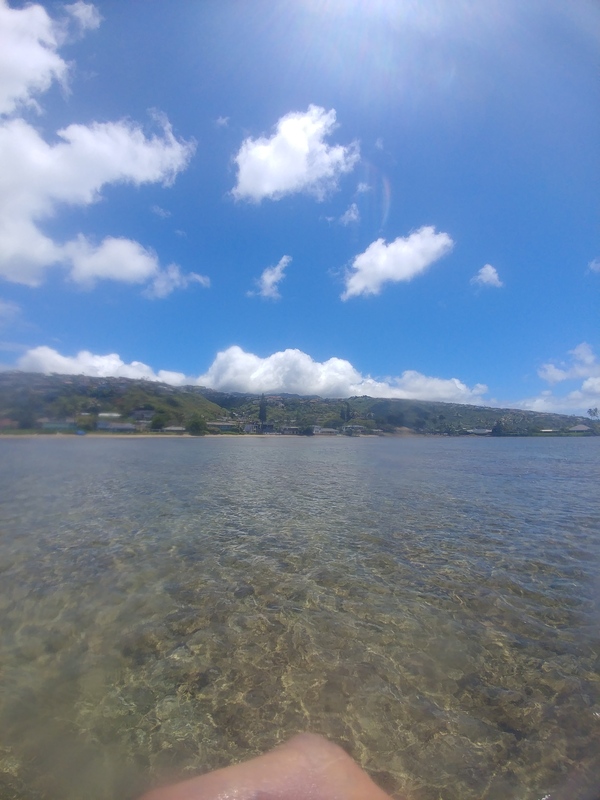 Heʻeia fishpond has been restored and maintained by Paepae o Heʻeia, a nonprofit organization founded in 2001, this organization is dedicated to the fishpond and works in partnership with Kamehameha schools, the land owners of Heʻeia. Most of this information was gleaned from their beautiful Pae Pae o Heʻeia website, where you can find lots more information about Heʻeia. Huilua is a smaller fishpond, comprising 7 acres of Kahana bay. Kahana is part of the Hawaiian Division of state parks, and is maintained and restored by a group of local residents called the Friends of Kahana. It is said that two moʻo, large lizard water spirits, are the protectors of Kahana from environmental and human treats (such as fish theft). Yesterday I visited three sites on the south shore here on Oʻahu in search of submarine groundwater discharge (SGD) seeps. As you can see from the video, my search was successful! These seeps occur at the interface between subterranean estuaries and coastal marine waters. The basaltic islands of Hawaiʻi have three very important traits when it comes to groundwater: 1). most basalt is porous and able to hold water, however, 2). the different lava flows are very heterogeneous in their composition and porosity (their compositions and ability to hold water differ widely), and, in most places, 3). a less permeable caprock prevents water from flowing out from the island surface. The freshwater lens that occurs in volcanic islands extends below sea level, due to the buoyancy of the fresh water. The fresh water floats on top of the sea water, while gravity pushes the fresh water downwards, causing the fresh water to push the sea water down as it extends below sea level. Where permeable layers of rock meet the shoreline we see submarine groundwater discharge pushed out by this pressure. This is especially obvious at low tide, when the weight of the overlying seawater is lessened or removed. This SGD seep occurs below the low tide line, but has enough pressure pushing fresh water out of it that a boil occurs on the seawater surface! At very low tides SGD seeps can be seen above the tide line, free flowing from the beach. A SGD seep above the low tide line. You often feel this fresh water by its characteristically cooler temperature signature.